Parliamentary Under Secretary of State for Children and Families, Edward Timpson has written to adoption agencies across England thanking them for their work with children and adoptive families and urging them to make use of First4Adoption’s new recruitment marketing materials. 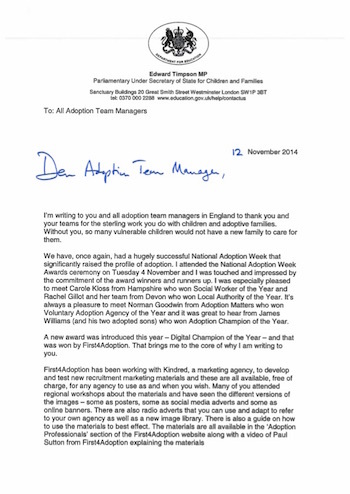 In the letter, posted this week, the Minister name-checks the winners of this year’s National Adoption Week Awards – where he was special guest – before endorsing the new First4Adoption recruitment resources. Download and view the letter in full here.